Bill Pieh, founder of Centaur Forge, Ltd. died today. Bill was one of the "old guard" of blacksmithing that has helped support American farriers and blacksmiths through a time when there were almost no resources for blacksmiths. 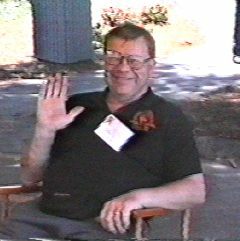 In 1998 Bill had bypass surgery and was still recovering while attending the ABANA conference in Asheville NC. His love for blacksmithing was so great that he attended the conference despite his doctor's advice and family's wishes. We saw him again at CanIronII in Calgary Canada last summer and he was doing well. He recently had a heart attack while attending another conference. He died while resting at home. Bill was 65, and is survived by his wife Bonnie, three sons, two daughters and seven grandchildren. Bill was born and died in Burlington, WI, where he established his business, Centaur Forge Ltd., (details page 2). Bill Pieh established Centaur Forge, Ltd. in 1960. His early catalogs were no more than a few stapled sheets. According to Richard Postman in Anvils in America Centaur took over the importation of Swedish Kohlswa anvils from the Swedish-American Steel Company in 1960. These anvils were sold with the Centaur trademark until the mid eighties when they started having a quality problem. As late as 1977 the Centaur catalog was only 28 pages (14 sheets plus order forms). Today it is over 200 pages. In the 70's Bill Pieh added the Kuhn air hammer line to the list of tools and equipment he had made or imported. He said, "I brought one of these to the Purchase, N.Y Conference. Everyone liked it". When I first met Bill at the Ripley, WV ABANA conference in 1984 he was showing off Kuhn hammers and when I met him again at Asheville in 1998 he was still showing off Kuhn hammers. The burial will be on Tuesday morning in St. Charles Cemetery. Bill Pieh At the June 1998 ABANA Conference in Asheville, NC. From video by Jim "Paw-Paw" Wilson. anvilfire removes translation system from News page. Last issue we experimented with something new, Systran's on-line translation service. The system may work for certain types of web sites but created a huge amount of overhead and work for us. On a page that has links to hundreds of other pages it was impossible to make the system work properly. Future editions will be translated and static pre-translated copies of each page maintained. If our translation service is useful to you we would like to hear about it.